The beloved oak at Lichgate stands guard over many treasures and one of these is the meditative labyrinth lying on the southern shoulder of Laura’s cottage home. 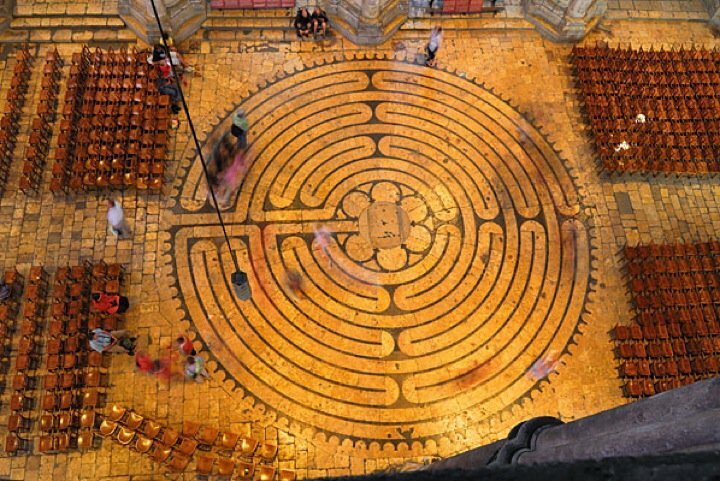 This labyrinth was created to be both a memorial and a celebration of a man’s life. The threads connecting Maury's memory and Lichgate were woven soon after this call and with the help of members of both the Damayan Garden Project and the Laura Jepsen Institute, work was completed on the lined pathway you see today. Finished in 2009, it has greeted thousands of visitors and remains one of the signature parts of the Lichgate landscape. A special large stone was selected to mark the entrance to the labyrinth. Looking from the oak, the end of this stone gives the appearance of tree rings, rings that echo the motif of the labyrinth itself. One of the volunteers from the Damayan Garden Project named Kathy Weiss assisted in designing the labyrinth and a local artist named Joanna Angelos created the centerpiece of glass and tile. Blown glass crystals were made that contained a portion of Maury’s ashes and these were embedded amongst the colored tiles, colors meant to symbolize the spectrum of the rainbow. 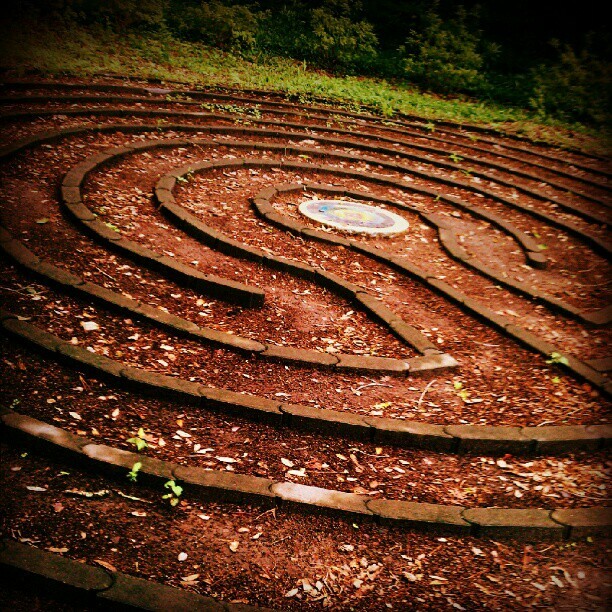 Lastly, what would Laura have thought of a labyrinth near her home? The answer to that is actually easy to find in both her travels and words. "Solo journey around the world (all continents except Antartica) to see art works (of man and nature): Inca ruins, El Greco paintings, Chartres Cathedral, Byzantine icons (Kremlin), Giotto frescoes, pyramids and sphinx, Taj Mahal, Emerald Buddha (Bangkok), platapus (Australia), Grand Canyon, 1972". So how is this journey of Laura's related to the labyrinth? Of all the highlights listed from each continent, there are only two building specifically mentioned, the Taj Mahal in Agra, India and the Chartres Cathedral in Chartres, France. The cathedral is a gothic structure that has attracted pilgrims for over a 1000 years and is famous for a unique feature found on its floor, a labyrinth. A picture of the Chartres labyrinth may be found on the right. From Laura's words our research uncovered the following acknowledgement in her PhD presented in 1946, "For guidance through the maze of three epochs, through labyrinths of thought ultimately terminating in the endless thought of tragedy inhering in the nature of life...". In much the same way as the Lichgate itself was a physical embodiment of Laura's thoughts, "Because for more than half a century my thoughts have moved in and out of an imaginary lichgate, I have decided to erect a memorial “fytt and fine” to the world of retrospect." (Chapter II, paragraph 5), so to is the present labyrinth a perfect physical expression of concepts Laura understood all too well, the tangled threads of life, tragedy and memorial.